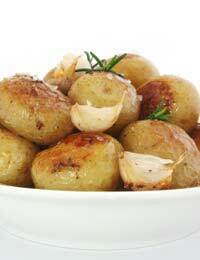 A staple food in the British diet since the 18th Century, the humble potato should not be underestimated. It is available all year round, is rich in vitamins B6 and C, potassium and other nutrients and, of course, is a valuable source of fibre. That said, much of the goodness, and flavour, can be destroyed through careless preparation and cooking, so it is worthwhile bearing in mind some of the pointers to successful potatoes. What Are The Best Ways To Buy And Store Potatoes? Buy in bulk if you have room, but in any case buy unblemished, firm potatoes and store them in a cool, dark place where they will keep for several weeks. It is the light which turns them green and less digestible. Are They Best Cooked Peeled Or Unpeeled? Most of the goodness is contained close to the skin and potatoes with skins left on have more flavour. Filled jacket potatoes are a popular healthy dish and our tastes have also moved towards salads of new potatoes with skins intact. When you have to peel potatoes, take off the thinnest amount of skin with a good peeler. What Makes The Best Mashed Potato? Choose floury potatoes such as King Edward or Red Desiree and simmer gently during cooking with a lid on the saucepan. When drained, put a clean cloth over the saucepan for a few minutes to absorb steam and dry the potatoes. Add a good knob of butter and a few tablespoons of cream or creamy milk. Whether using a potato masher, ricer or electric whisk, make sure you beat or mash the potatoes until they are soft, creamy and lump-free. You can ring the changes by adding soured cream and chives to the potatoes, or soured cream and a generous grating of whole nutmeg. Why Do Roast Potatoes Sometimes End Up Soggy? Chances are you have used too much fat or the wrong cooking temperature for your oven.In the past we roasted potatoes around the meat they were to be served with, but the fat needs to be much hotter than this is likely to be. Also, many cooks use olive oil now as a healthier alternative. Use a solid roasting tin and put it in the oven with the fat, or olive oil, at Gas mark 7 (220 degrees C) to preheat while you parboil (part boil) the potatoes. Do this by pouring boiling water over evenly sized potatoes or potato pieces, with a little salt, and simmer for 10 minutes before draining. With the lid on, shake the saucepan to roughen the edges of the drained potatoes. Add the potatoes to the fat in the roasting tin while it is really hot (keep the tin over direct heat and, with oven gloves on, baste the potatoes with a long-handled spoon). Put the tray on the highest shelf of the oven for 45-55 minutes, turning the potatoes half way through. Serve immediately. Is There A No-hassle Potato Dish I Can Serve At A Dinner Party? Potatoes Boulangere is a good dish which needs no last-minute attention and does not spoil if things are running late. Use your roasting tin or a wide, shallow baking dish and butter it generously all over. For 4-6 people peel 900 grams of potatoes and cut them into thin slices. Peel and finely chop a large onion. Arrange a layer of potatoes over the tin, followed by a scattering of onion and salt and black pepper and continue with the layers, finishing with a layer of potato. Pour over 150 ml of hot stock and 150 ml of milk and dot the surface with butter. Place the tin on the highest shelf of the oven and leave for 45 minutes or until the potatoes are cooked and the top golden-brown. You can use leek instead of onion. Is Sautéing Potatoes A Simple Technique? Yes, it is simply shallow frying using a saute pan (or deep-sided frying pan) with a little fat. During cooking you must keep the sliced or diced potatoes moving around in the pan constantly, turning them over until they are evenly browned. If using ‘old’ potatoes, they are best peeled and sliced into 6mm slices. Leave tiny new potatoes whole. You can use butter, oils, dripping or bacon fat and use a fish slice to turn the potatoes. You can speed up the process by parboiling the potatoes.